Who's watching out for your success? Speaker 1: Welcome to Optum's Ask the Expert series focused on uncovering hidden funds with comprehensive payment integrity. In our third podcast, Robert Mayer, vice president of product strategy for Optum's payment integrity solutions describes the key characteristics of an optimal payment integrity vendor partner. 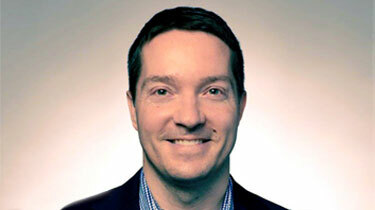 What are key considerations when selecting a vendor? Robert Mayer: First of all, their experience in the marketplace. Do they perform prepay services today for other health plans? Secondly, how transparent are they in their prepay process? Will they work with you in the establishment of analytics to ensure your organization has the ability to review and approve the potential analytic before it’s implemented and begins to impact their provider network? Finally, will they enter into a value-based contract that works for both the health plan and the vendor? Are the incentives and goals mutually aligned along the health plan to properly manage the program and ensure that vendor is working successfully for the health plan? A good vendor is someone who's constantly bringing new opportunities for health plans year over year, and not relying on past analytics or trends in perpetuity. A mature organization identifying vendors who can offer solutions in both prepaid and postpaid space, and could be incentivized to move ideas from post pay to prepay, as an example of a high functioning payment integrity program. Speaker 1: A partner versus vendor, what's the difference? Robert: A vendor is someone who has a singular focus, who is simply incentivized only financially based on their savings results for their individual solution or service. A partner is someone with a larger footprint and a health plan, but also is incentivize alongside the health plan’s results. Value based contracting is established so that the success of the partner is directly tied to that of the health plans payment integrity results. Moving a company from a vendor to a partner is a strategic choice by the health plan. 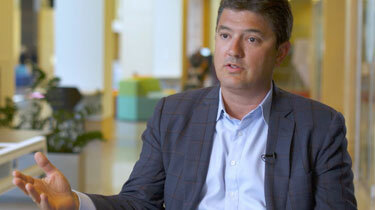 Not all vendors can be partners because of their limited scope of service in the marketplace. To be a true partner, an organization must have a full end [unintelligible 00:02:04] solution to set of payments for every components so they can truly help impact all aspects of the payment integrity performance. For example, Optum operates solutions in the claim and EDI gateways, and has prepaid solutions, including quick claim editing, prepaid injury coordination, COB, waste and error, fraud, medical policy termination, and medical record review programs. Additionally, Optum has postpaid solutions around contractual data mining, coordination of benefits, subrogation, credit balance and collections. A partner is not only measured by savings result, but also around other items, for example, ideation. How many new trends or analytics they bring for each year? How many of those analytics and trends are moved from postpaid to prepaid, creating SLAs and KPIs that align to help plan goals directly. All those are examples of how a partner can be measured versus a vendor. Speaker 1: How does a holistic partner optimize your comprehensive payment integrity strategy? Robert: At the highest level, a partner is not just performing a service for a health plan clients, but is also a thought partner who is helping to help plan across the organization, and they have mutually aligned goals to the health plan’s payment integrity goals. When a payment integrity program is fully established, and you have a true payment integrity partner, your ability to impact the health plan’s delivery is substantial. You become able to write analytics on any aspect of the organization that the client wants to help them identify opportunities for payment accuracy. But also help them attempt to bend the trend, identify average seasonal network and bring leading R&D ideation from markets and organizations outside their four walls. Together you both work side by side, the most senior levels of the organization to help the health plan be a leader in their markets and region. The right partner can help you achieve your goal. Listen as Robert Mayer, vice president of Product Strategy for Optum Payment Integrity, provides guidance on selecting the best partner — not a vendor — to support your comprehensive payment integrity strategy. Payment integrity by the numbers: How much are you losing? 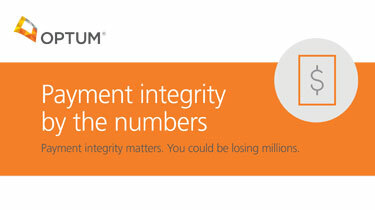 Blog: What makes Optum the right payment integrity partner?